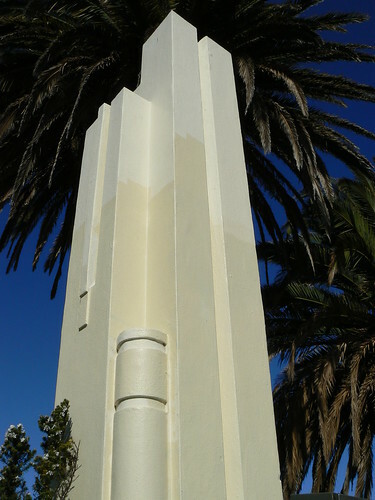 This imposing art deco tower is in the Perth suburb of Highgate. 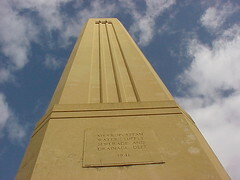 The Lincoln Street Ventilation Stack was built in 1935 as a sewer vent by the Metropolitian Water Supply, Sewerage and Drainage Department. It failed to adequately disperse the gasses and by 1941 was sealed and decommissioned. Since then it has been used as a transmission tower. 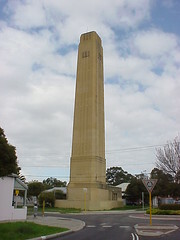 It dominates the suburban streets and must be an amazing landmark to live next to. 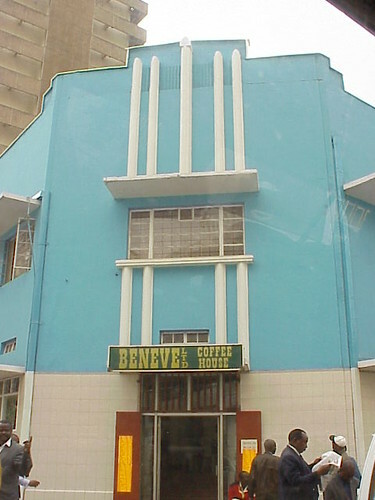 This is another deco building in Nairobi, snapped from a minibus. The paintwork is very similiar to Sirona House and the Beneve Coffee House may even be part of the same block. The Grand Concourse, in the Bronx, features some wonderful Art Deco apartment blocks. The decoration on the facade of this building features classic deco motifs such as frozen fountains, radiating light rays, city buildings and zig zag patterns, all in multi-coloured tiles. There are also turkey in colour and other birds in terracotta. 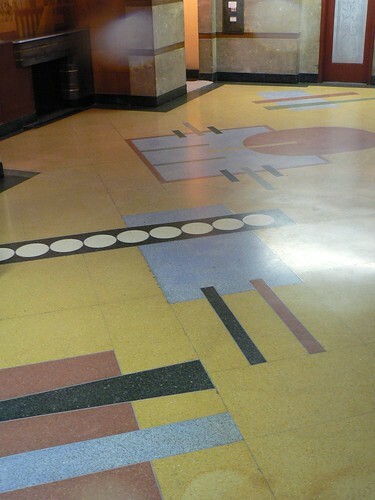 The foyers of these buildings feature coloured terazzo floors with abstract deco patterns and some have fantastic fireplaces. 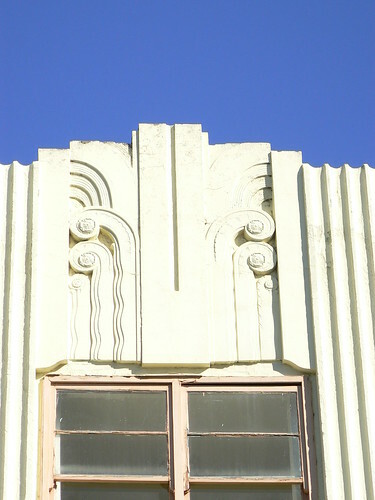 The New Zealand town of Hastings, like the surrounding area and neighbouring town of Napier, suffered a lot of damage and loss of life during the 1931 earthquake and a major effort was required in the following years to rebuild the city. 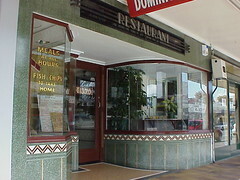 The Dominion Restaurant was built in 1935 by Edward Anscombe & Associates and now operates as a fish and chip shop. 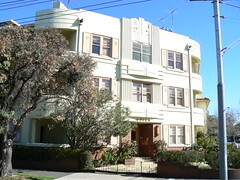 A lot of Hastings was rebuilt in Spanish Mission style but as you can see, the Dominion, is pure Art Deco. The asymetrical windows either side of the entrance, curved on one side and stepped and angled on the other provide a great point of interest while the whole facade is drawn together by the green tiles and zig zag design below the windows. It was closed when I visited Hastings but even time I look at this picture I wonder whether they have a nice booth where I can snuggle in with a huge plate of fish & chips. 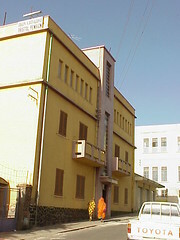 Another Art Deco building in Asmara, the Bristol Pension. I don't know what the accommodation is like there but it is an art deco building so it must be worth a look on that basis alone. The building is symetrical around a central stairwell. 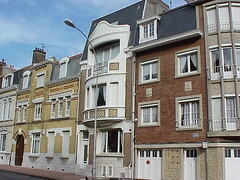 There are two small balconies on the second storey. At the base of the building roughly cut dark stone has been used to give the building a level base. According to Asmara - Africa's Secret Modernist City by Edward Denison, Guang Yu Ren and Naigzy Gebremedhin, the building was built during the 1940s, originally as an apartment block, and was named the Bristol Pension in the early 1960s. They also note that the interior floors are topped with finely ground seashells 'providing an incredibly smooth finish'. 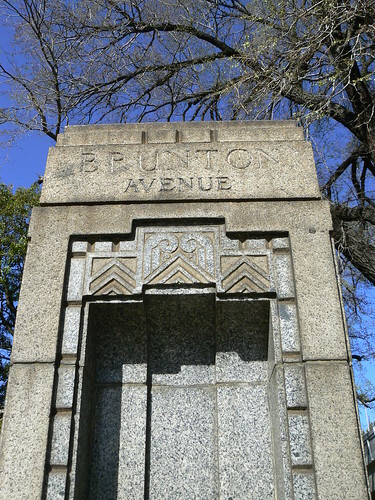 I was out and about early this morning, getting tickets for next Saturday's big game, so I decided to see if my memory was correct regarding the art deco drinking fountain near Punt Road Oval. As you can see I did remember correctly and this one is identical to the one at the other end of Brunton Avenue except that the inscribed avenue name has been turned 90 degrees to faces the roadway (which makes sense) and is gold coloured. I've spent a fair bit of time around the Brunton Avenue area this weekend, there is a magnificent sporting ground there and I spent a good part of Friday and Saturday night there. I must say that Friday was better than Saturday but that is of little concern now. 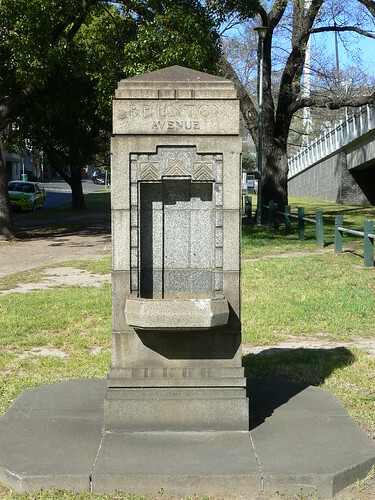 I was back there today, Sunday, not for sport this time, more passing through on my way home, and I took notice of this disused drinking fountain on the edge of Yarra Park, very near on Brunton Avenue. I've seen it before but never stopped to really look at it. You tend to miss the detail flying past in the car and it isn't exactly on a busy walking route. Today I was on my pushbike so I was going slow enough to take in the decoration. Especially the carved panels above the recessed openning depicting chevrons and frozen fountain motifs. 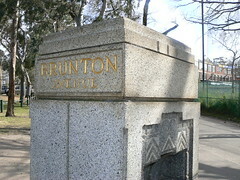 I seem to remember there is another one of these on the pathway from Richmond Station to the MCG between Punt Road Oval. I'll have toi check it out next Saturday and see if it is the same. 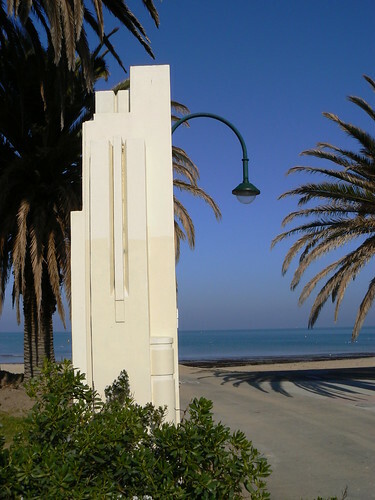 There are a couple of art deco pillars on the St Kilda foreshore along Jacka Boulevard that were designed by architect of Canberra, Walter Burley Griffin. They consist of stacked rectangles with relatively deep vertical grooves and a single rounded element on the inside of each one. They mark the entrance to Brooks Jetty and according to the 2004 St Kilda Pier Kiosk Conservation Management Plan by David Moloney for Parks Victoria the pillars are orphans of an 'extensive streetscape design'. I've seen a photo of a much older Royal Hotel on this prominent corner in Footscray dating from around the 1880s but I don't know if this is a complete rebuild or a make-over. 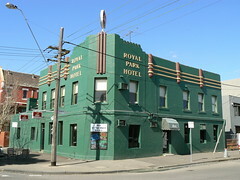 So many Melbourne pubs were renovated during the 20s and 30s to help them prevent their hotel licences being recinded and the pub closed by the authorities. In any case it is a great hotel, a great ship even, with a rounded facade on the apex of the corner. The decoration is minimal with some speedlines on the parapet and tiled columns either side of the entrance. 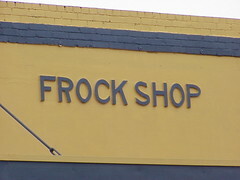 I took this photo in 2005 and I noticed when I passed recently that the paintwork around the name still hadn't been finished. 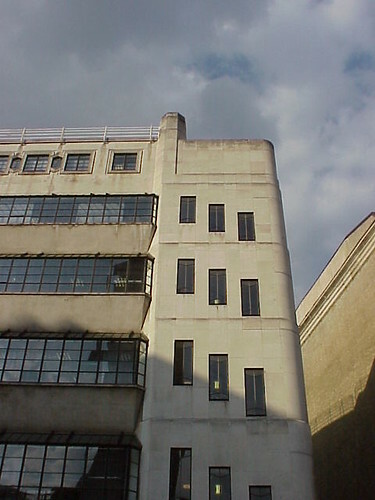 St Olaf House was designed by H S Goodhart-Rendel for the Hay's Wharf Company in 1928-32. 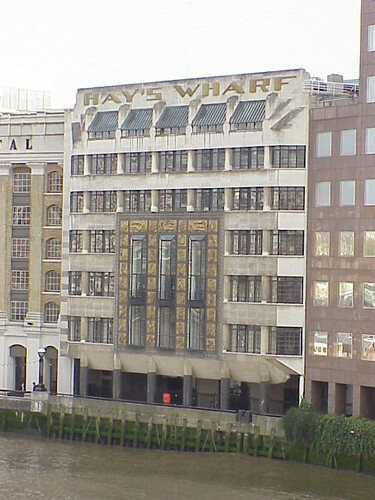 The Thames frontage (above) carries the name of the company in gold stylised lettering along the top. 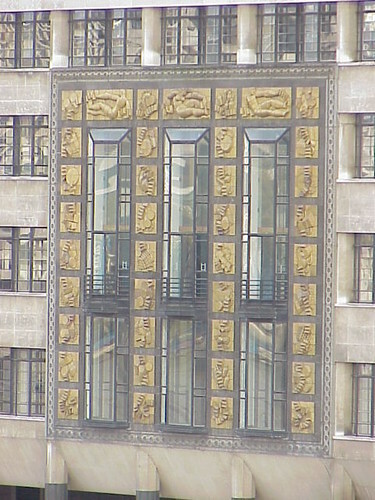 The central section of the riverside facade features 3 stylised figures and 36 smaller abstract panels, also coloured gold. At first glance the Tooley Street facade aapears nowhere near as decorative but on closer examination there are some lovely features starting with the stylised St Olaf House above the doorway almost at street-level. 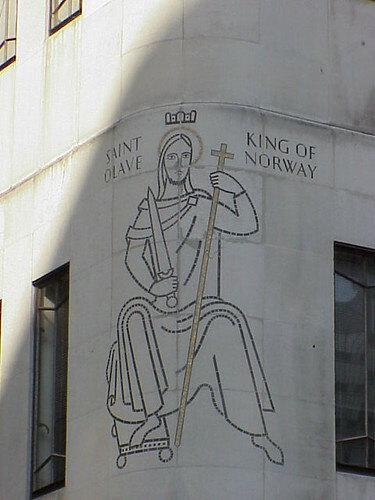 St Olave, himself, King of Norway, is represented on the curved corner of the building surrounded by thin rectangular windows arranged in sets of three. Then at the other end of the building, the windows are arranged, still in sets of three, but offset so that they step down. But my favourite is this doorway. 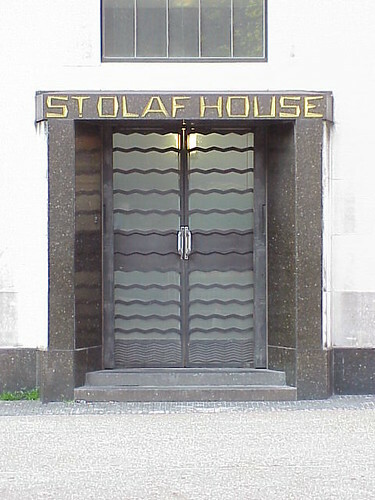 Again St Olaf House is spelt out in stylised gold lettering. 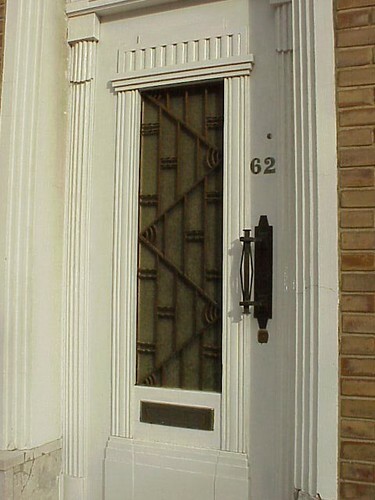 And the door is stunning with the wave motif protrayed in the metalwork. 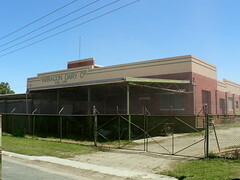 The Regional Art Deco Festival is on this month around Victoria and it reminded me of the Yarragon Dairy in funnilly-enough Yarragon. A modest buildng, with modest decoration but very stylish. 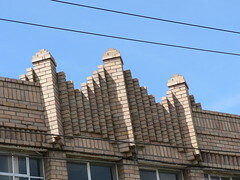 Two recessed lines tracing the stepped roofline and lettering spelling out Yarragon Dairy Co in relief. It even has a square pediment set back from the facade with a flagpole. Maybe not worth a special trip but if you are heading along the Princess Highway between Warragul & Moe then Yarragon makes a great spot for a break. The Masters Lodge sits on the hills overlooking Napier on New Zealand's east coast. 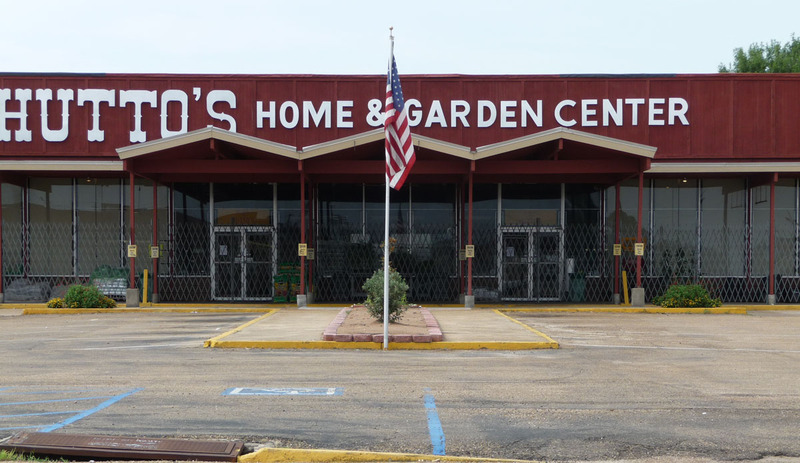 Originally built in the late 1800s it was made-over in the 1930s. 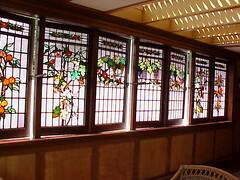 I love these leadlight windows depicting orange trees in full fruit and grape vines across the cenral panes. Avila is a fantastic block of flats in the Melbourne suburb of St Kilda. 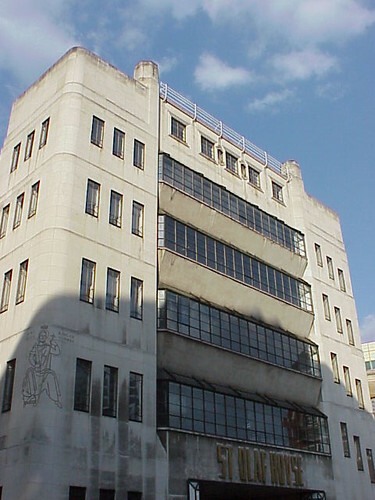 Dating from 1935, it sits across the corner with an impressive art deco facade designed by architects Beedham and Wright. I particularily like the curved balconies that wrap around the edge of the facade leading to the plainer wings of the building. 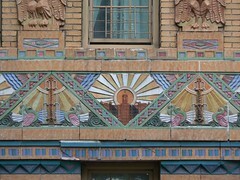 One of the more striking elements is the decoration at the roofline above the main entrance. Other elements include faux balconies at each of the central windows and the wooden shutters held back with 'S' shaped fixtures and featuring a square cut-out decorative panel. The entrance too is fantastic. 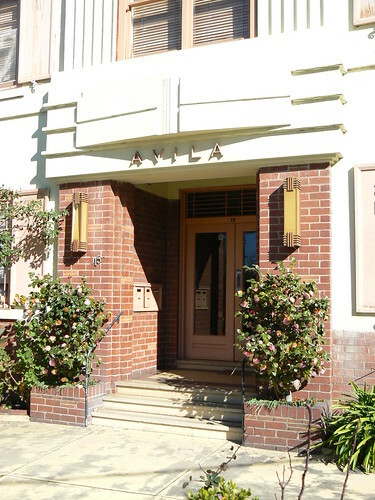 The door is setback into a shaded porch flanked by simple brick planters while stylised lettering spells out Avila. 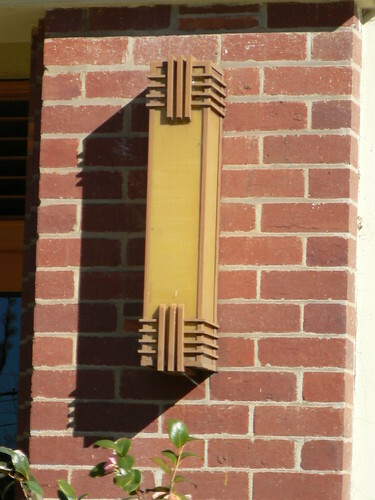 The wall lights on either side of the porch opening are pure art deco. Avila was used in the 1997 Australian televison series Good Guys, Bad Guys. Lead character Elvis Maginnis, played by Marcus Graham, lived here and the establishing shots of the building are just about all I can remember from the programme. 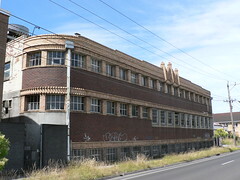 I like the brickwork on this old factory in Footscray. The use of different coloured bricks creates horizontal bands along the facade of the building. The cream bricks have been arranged to provide the decoration. The band above the upper storey windows have bricks set on their end, angled and set back from the level of the other courses of bricks. The band of bricks above the second level windows are much more interesting. The central band again consists of bricks standing vertically on their end but above and below this band the bricks have been laid on an angle so that the protrude from the surface of the wall crating a wonderful zig-zag pattern. It stands out particularily at the curved end of the building. The zig-zag shadows cast on the windows are especially nice reminding me of the saw-tooth roofs used on many Australian factories. But the most amazing brickwork can be found in the decoration at the centre of the building at the apex of the slightly stepped roofline. It consists of three triangular columns capped with a pyramid of bricks and separated by a series of columns created by angled bricks. Truly spectacular but perhaps the most amazing thing is that it is duplicated around the corner over the loading bay. 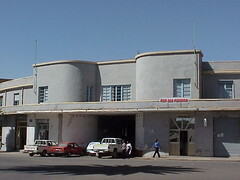 Another example of the many Art Deco buildings in Asmara. The sign above the door on the right reads Red Sea Pension and the building presents a sweeping curve from a central driveway. The wings have simple windows and a continuous concrete eyebrow providing some shade. 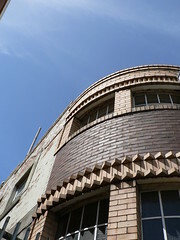 The central driveway has curved walls each side of the entrance which are continued onto the second storey where the roofline reaches slightly higher than the rest of the building. 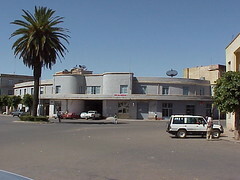 Each end of this raised section supports a thin metal flagpole which is often preferred in Asmara to the usual wooden ones. I've been looking through some of my older digital pics over the last few days and found some of this apartment block in Calais. 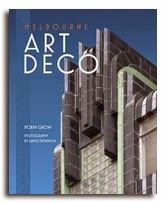 From a distance it doesn't look particularily art deco, certainly not streamline but it has some great deco details. The decorative brick panels on the upper storey bay windows are great as is the metal work on the balcony. At street level, however, there are a couple of gems. 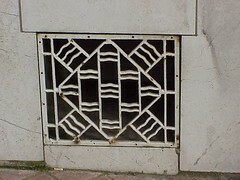 This vent in some ways mirrors the brickwork elsewhere on the facade but takes it to a new level. The combination of straight lines and wavy lines, arranged in threes or pairs, works really well. The decoration on the door is also fantastic. The handle and baseplate have lots of style while the metalwork is presented as a zig-zag combined with conbinations of vertical lines, short waves and and series of curves in the angles. 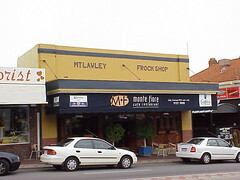 This cafe in the Perth suburb of Mt Lawley isn't that deco but the signage showing the former purpose of the building is just wonderful. 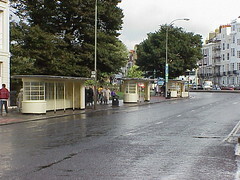 Brighton, on England's south coast has, or at least had in 2000, these fabulous deco bus shelters. These three shown in the photo right are simple structures with curved ends and an oval roof. 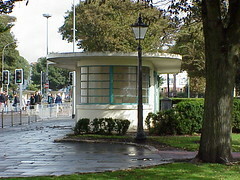 Nearby was a more substantial shelter. 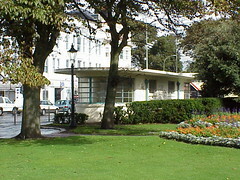 Bigger and probably made of concrete with an oval concrete roof backing onto the gardens. 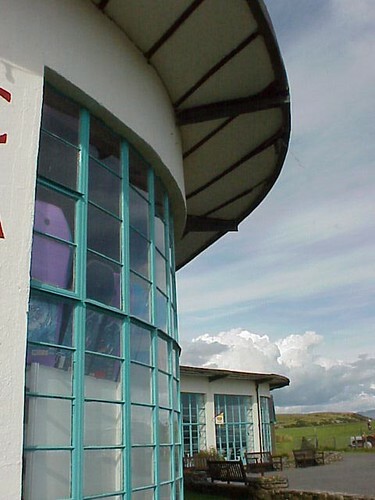 The small welsh seaside town of Cricceth is the location of this boomarang shaped cafe. It was designed by Sir Clough Williams-Ellis, who also designed Portmeirion and is Grade II listed. 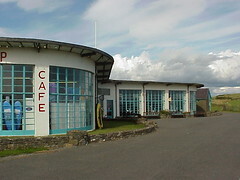 The cafe was refurbished in 2007 and no doubt looks even better than when these pictures were taken in 2001. 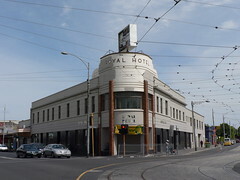 I like this building, the Royal Park Hotel in North Melbourne. The speedlines are really chunky and look like they are plasticine snakes stuck on the front of the building. They wrap around the the barrel of the vertical decorative elements adding to the impression they were added at a later time. I like that the building is not square. The Howard St frontage is longer than the Queensberry St frontage. I like the three lines at the apex of the roofline on the corner. I assume there was originally a door at street level on this corner and I'm surprised the isn't even a window there now. I even like the mish-mash of wires, tv aerial and telegraph pole. I guess I have to like them because they are all over my picture and that is what this corner actually looks like. I don't like the colours but they are transient and perhaps the next paint job will be better. 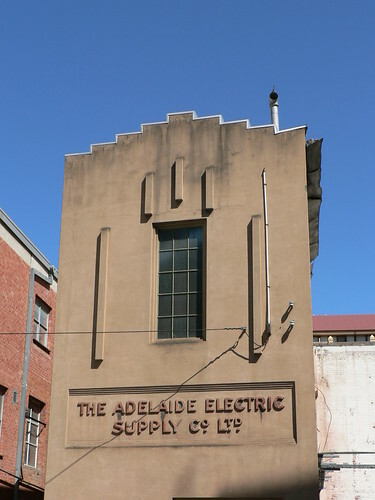 I love this little art deco building, a power station for the former Adelaide Electric Supply Company. The extreme stepping of the roofline is joyous and it is not surprising to find the the rule of three employed in the decoration above the window. 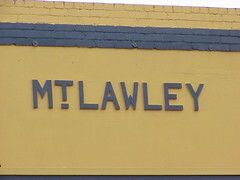 Then just to top it off a recessed panel taking up the lower part of the facade contains the company name, so long that it requires a second line. Certainly worth a detour along Post Office Place.